There’s always the vanilla/traditional way of doing things, but sometimes you feel like you want to add an extra oomph to your wedding flowers and accessories. Taking a fresh and out-of-the-box approach while planning your wedding, allows you to infuse some uniqueness into your wedding. It could be anything from infusing traditions from other cultures, to recreating the hottest designs on the runway. 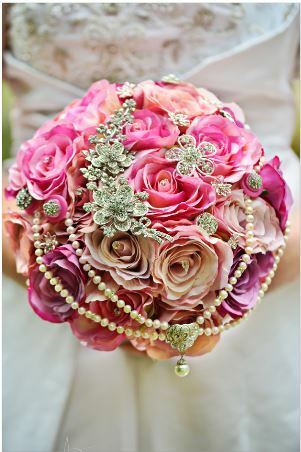 Over the past year or so, we have noticed an upward trend in the use of brooches to create unique and glamorous bouquets. ‘Bling’ is definitely in! This entry was posted in Uncategorized and tagged Accessories, Artificial and Silk, Floristry, Flower, Flowers and Bouquets.